Campanology has a very particular following and if I fail to correctly describe any part of the subject on this page then please offer any necessary corrections! 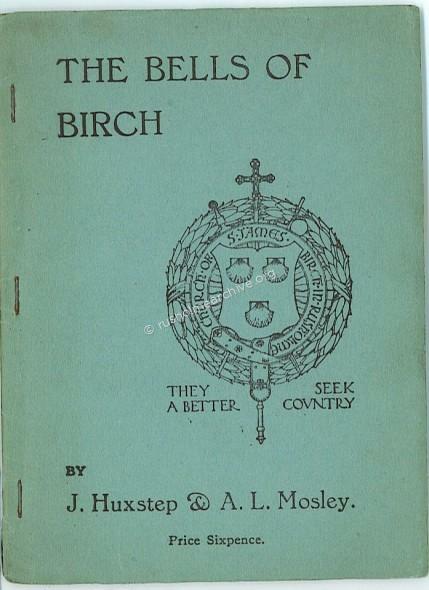 All that I have written has been extracted from the 'History of Birch-in-Rusholme' by J S Buckley. The little booklet below does seem to have been lost, perhaps it will eventually re-appear! 'The tower was built for a peal of eight bells, but these were not added until 1863, July 25th. They were supplied by Messrs. Mears and Stainbank, London. The first peal was rung on St. James's Day, July 25, 1863. I have a distinct recollection of the event, as a chorister. It was on a fine Saturday afternoon. We had an augmented choir (there was a Voluntary Choir Association in those days). The clergy and choir, after robing in the schoolroom, went in procession to the Church. It was a glad day for Birch. 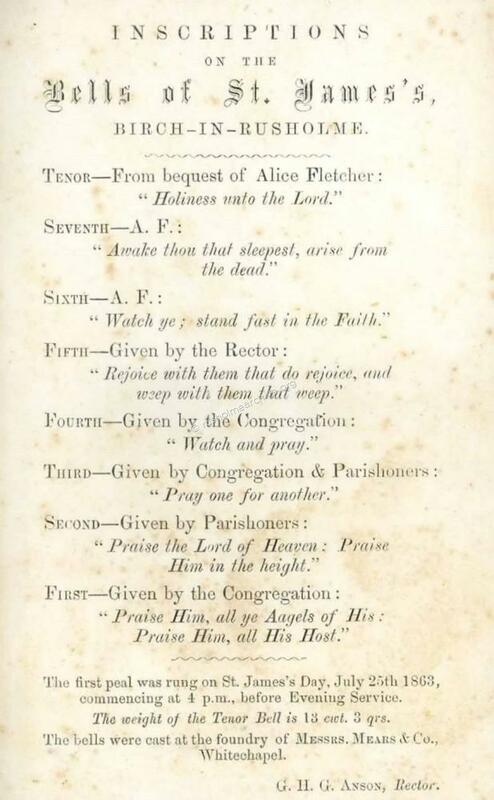 The Archdeacon preached from the text " Holiness to the Lord," the inscription on the Tenor Bell'. Further into the book J S Buckley gives a more detailed account of the bells, but seems to pass lightly over the very sad fatality that happened that day. 'I have stated that it was intended to place bells in the tower as soon as the Church was built, but this was delayed to 1863. 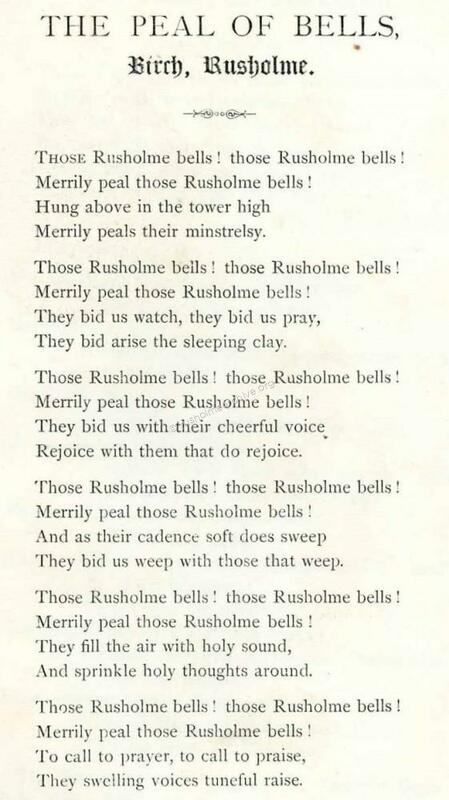 Meanwhile, a band of ringers was formed, who practiced at St. Philips', Hulme. A fatal accident marred the whole proceedings. A beam fell upon Mr. John Venables (the father of the choirman of that name) as he was standing in the south porch, and killed him. He was the gardener at Birch Hall. The ringers intended to meet the bells at the old toll-bar, Moss Lane, on their first arrival; to unhorse the lorry which was carrying them, and draw the bells to the Church. The lamentable circumstance just alluded to constrained the Archdeacon reluctantly to veto this jubilation. It would have been a touching sight, for one sees behind all this the devotion of a noble band of ringers to their sacred work, a feeling which, we are sure, has inspired all their successors'. 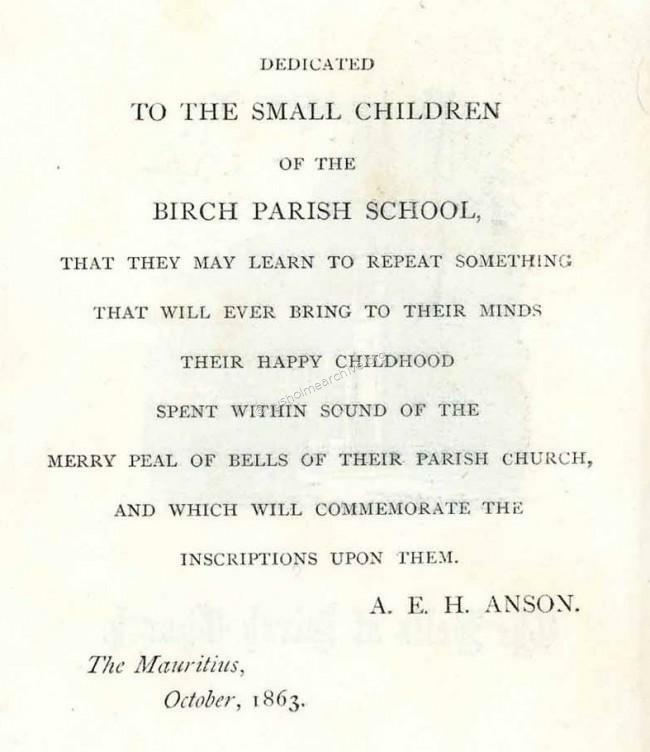 When the bells were first hung in the Church Sir Archibald sent a poem to the children at Birch school to commemorate the occasion. Sir Archibald was the younger brother of Archdeacon Anson and seemed to have taken a continuing interest in the various events at St James and Birch. This was in spite of his career which started in the army and seems to have taken him to far parts of the Empire. A brief account of his biography is below! Major General Archibald Edward Harbord Anson, Lieutenant-Governor of Penang, Malaysia. Born 16 April 1826 in a family of seven, three brothers and three sisters. Anson was born in company with a twin sister at 32 Devonshire Place, London. His father was Major General Sir William Anson, K.C.B. (1st Baronet Anson) and his mother was from the Dickenson family. He was taught Latin grammar by his father before he went to school. His military experience began from 1844 to 1847. 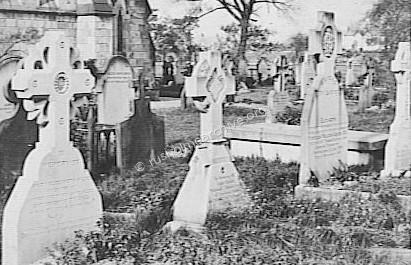 He served in England, Ireland and Scotland from 1847-1855, Mauritius, 1857-1862 and Madagascar 1862-1865. He then returned to England and was appointed as the last Lieutenant Governor of Penang from 1867 to 1882, after serving in the army in India. This quaint message below was sent to the children at Birch School from Mauritius in 1863. I will leave it to your judgment as to the merit of Sir Edward as a poet! The Bells as described by George Anson, Rector. In 1980 St James, Birch-in-Rusholme became redundant. 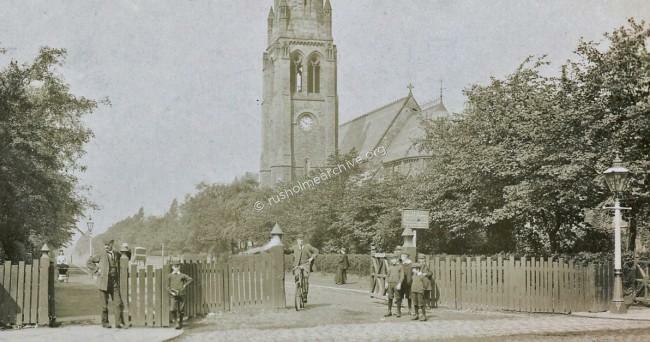 The parish had merged with Holy Innocents at Fallowfield so the bells were taken down at Birch and moved to Holy Innocents where they are still regularly rung.